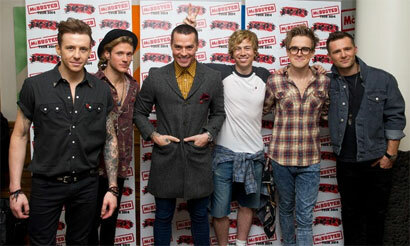 Rock boygroups McFly and Busted have joined pop forces to create McBusted. The new 'supergroup' is set to embark on its first arena tour in 2014. The news follows McFly's sold out Royal Albert Hall shows this September, which were part of the bands's 10th anniversary celebrations. The two remaining members of Busted, Matt Willis and James Bourne (third member Charlie Simpson left the band in 2005) were surprise guests for the shows. Combined, Busted and McFly have sold 15 million records worldwide including ‘Year 3000’, ‘What I Go To School For’ and ‘Crashed The Wedding’ from Busted, and ‘5 Colours In Her Hair’, ‘Obviously’ and ‘All About You’ from McFly. Together, the bands have achieved 14 No. 1s, 20 top 3 singles and 27 top 10 singles. Pre-McFly, Tom Fletcher was the fourth member of Busted but after being fired from the group he founded McFly. During this time he still continued to write songs with Busted’s James Bourne and as a result, McFly joined them on tour in 2004. Busted disbanded in 2005 after Charlie Simpson left to create the rock group Fightstar. McFly members have also ventured down different paths during their recent hiatus. Harry triumphed on ‘Strictly Come Dancing’ and Dougie on ‘Im A Celebrity..’ Tom has written several songs for One Direction and is also producing an electronic album alongside his McFly and McBusted work.